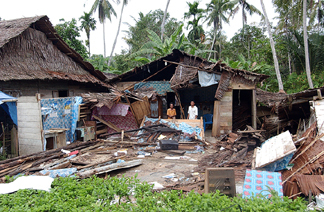 On March 28, a magnitude-8.7 earthquake shook the southern part of Sumatra on a piece of fault that had been put under greater stress by last Decembers much larger earthquake. But while a magnitude-8.7 temblor is large by any metric, the event did not create a massive tsunami. The difference, geologists say, lies in the geography and other geologic factors. Indonesian men stand among the rubble that was once their home before it was destroyed by an earthquake on March 28. That quake killed hundreds of people, but, unlike the Dec. 26 earthquake in the same area, did not produce a large tsunami. Courtesy of the U.S. Navy; photo by Photographers Mate 2nd Class Jeffrey Russell. Part of the reason is the geography and position of the triggered earthquake, says John Vidale, a seismologist at the University of California, Los Angeles. The movement of the fault during the December event was located in just the right spot to send out waves in both directions, out into the Indian Ocean and back toward Indonesia, Vidale says, with India, Sri Lanka and Thailand directly in the waves paths. But the March event took place at the bottom of the island of Sumatra, which blocked any tsunami waves that might have formed from getting to the Andaman Sea. It could only send waves to the south coast of Sumatra, Vidale says, and send waves in the other direction to the southwest, where the next land they could reach would be the Antarctic. Indeed, tide gages at the Cocos Islands near Australia registered a wave blip at about 25 centimeters (10 inches) high. Eric Geist, a geophysicist at the U.S. Geological Survey in Menlo Park, says that was about half the size of measurements taken there in December. Another site that had large waves in December, the Maldives, off the coast of India, saw waves in March that had 7 percent of the amplitude of the December ones. That variability of response will have to be considered in tsunami warning systems, Geist says. In addition to geography, the differences in the geologic positions and sizes of the March and December earthquakes also matter. At magnitude 9.0 (magnitude 9.3 according to some estimates; see Geotimes, April 2005), the December earthquake  so big that it was hard to immediately measure  ruptured the seafloor with a large vertical component, Vidale says, at a place where it could push a large column of ocean water above it. In contrast, Geist says, current calculations for the March magnitude-8.7 earthquake place the bulk of the deformation deep within Earth, closer to the originating point of the earthquake about 15 kilometers (10 miles) down. At that depth, movement on the fault could have been absorbed before it traveled up to the seafloor. Vertical displacement on the fault also may have happened mostly on land, Okal says, or along the islands offshore under shallow water. That would mean the rupture would have displaced less water than if it had occurred along a deeper submarine portion of the fault. Geist also says that in comparison to previous earthquakes of the same size that have triggered tsunamis, local or otherwise, the March tsunami may turn out to be surprisingly small. Scientists still have to determine exactly how the fault moved, work that will take some time, in addition to field checking their calculations. Visit the Geotimes Web Extra archives at www.geotimes.org/WebextraArchive.html for more coverage of the March 28 earthquake. Frozen ground is no surprise at Earths poles. 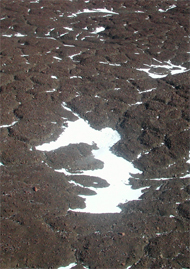 In the Arctic, permafrost consists mostly of frozen soil and rock, up to several meters thick, with some ice layers. In the Dry Valleys of the Antarctic, however, permafrost often seems to be thick layers of ice, covered by layers of thin till that are generally only several centimeters thick. These tongues of ice seem to be remnants of glaciers from neighboring valleys. Still, ice in the Dry Valleys appears not to have moved for a long time, and researchers are trying to determine exactly how dynamic the ice system may be. 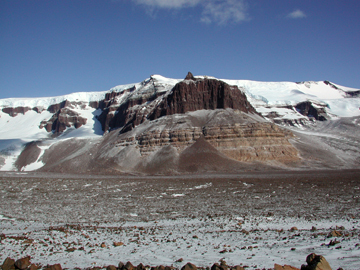 Beacon Valley is one of the Antarctics so-called Dry Valleys, which have very little precipitation and are some of the only ice-free regions on the continent. But the ice beneath the glacial till that carpets these valleys may be more dynamic than it looks. Photo by Ron Sletten. Very little precipitation falls in these valleys, in a region that is so dry that the ice is constantly sublimating  basically evaporating molecule by molecule, without turning to water first. Also, the valleys are patterned by polygon-shaped stress cracks, which form to relieve stress as temperatures fall and the ground contracts, in much the same way columnar basalt or mud cracks form elsewhere. These cracks commonly fill with water in spring in the Arctic, or ice wedges in winter, but in the Antarctic, they fill with windblown silt and sand, says Ron Sletten of the University of Washington, Seattle, a co-author of new research looking at the activity of ice in the Dry Valleys. Sletten and colleagues worked with modeler and mathematician Felix Ng of MIT to redate and model formation of the till overlying the ice in Beacon Valley. By analyzing previously published cosmogenic helium isotope measurements to figure out how long the rocks have been exposed to cosmic rays, they found that the till had formed in the past 310,000 to 43,000 years, the team reports in the February Geology. During freezing and thawing cycles in the Antarctic, permafrost forms pentagon-shaped cracks where windblown silt deposits. Photo by Ron Sletten. As the ice sublimates, the rocks and clasts below are brought toward the surface, forming layers below the till already in place. Their model shows that the rate of ice sublimation is greater than 7 meters every 1 million years. At that rate, the ice beneath the rocks and till is probably younger than 1 million years old, showing a relatively active system for the Dry Valleys. That rate of sublimation, however, is too fast to fit some previous research, in which scientists found that one Dry Valley till deposit contained a layer of ash that dated to 8 million years old. To have ash that old in place would be evidence for extraordinarily ancient and stable ice beneath it, potentially containing ancient climate data. But Ngs model and the teams redated rocks  measurements that match most of the rock exposures dated in the valleys  show that hundreds of meters of ice would have sublimated away over 8 million years, making it difficult to argue that the ash may still be in place, they say. But David Marchant of Boston University, who published some of the past research with colleagues on the ash layer, says that the new dates should be taken as a minimum possible age of the ancient valley ice, leaving open the possibility that the ice beneath is much older. He also says that the ash appeared to be unperturbed in its till layer: The fact that we can still find areas undisturbed tells us about the longevity of polygon cracks, he says, and that ice has been on the continent for an awfully long time.